In Simon's latest Mindful Frog Audio Adventure, you'll be visiting the garden of an extremely famous person. A garden that's big enough to hold rock concerts or have President Obama's helicopter land in it. We're not chasing a celebrity though, we're here to get a close look at the 200,000 Honey Bees who live in this well known back yard. You'll find out why bees love to dance, and what their incredible super-power is! For some cool pictures of bees to colour in, you can click Here, or Here ,or even Here! If you're keen to do some more of your own research about Bees, Click Here for an excellent page on the How Stuff Works Website. 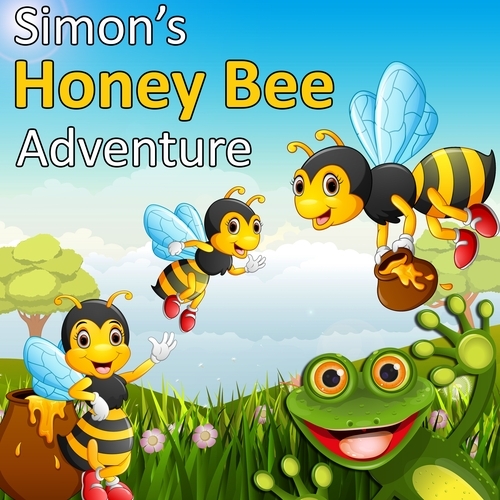 When your kids listen to Simon's Honey Bee Adventure they won't just be entertained, they'll be learning too! Check out the Fascinating Facts About Honey Bees below, they're totally fantastic creatures. Only 10% of the world's bees are social and live in hives, most are solitary and live in nests in the soil or trees or logs. In America they use 1.4 million "Bee Colonies" to pollinate their Almond groves. That's at least 5 Billion honeybees! 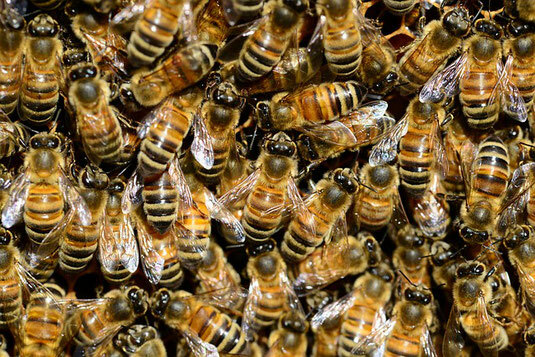 For every human on the earth there are 400 Bees. A Queen Bee can lay up to 1,000,000, (yes that's a million) eggs in her life. They don't see red very well, but are good with blues, greens, purples and yellows. They can see ultraviolet and polarized light, so they know where the sun is even on a cloudy day. They like their body to be 30 degrees Celsius before they go flying and can raise their own temperature by 25 degrees while they're standing still, and we don't know how they do it. 60 seconds after a Bee is born, it goes to work cleaning the honeycombs. Now that's what you call a work ethic! Bees don't get overweight by eating lots of honey, they just produce the wax they need to build honeycombs with. Sealed honey will last 1000's of years. Some 3000 year old honey found in the Pharaohs tombs was still good! The jar of honey you have at home took the bees about 20,000 trips to the flowers and back to make it. Their sense of smell is 40 times better than a human even though they have no nose. They smell with their antenna, mouth and feet. They do sleep between 5-8 hours a day and if they don't get enough sleep they can get lost and their dancing suffers. They do 3 types of dance to communicate information to other bees. A waggle dance, a shake dance and a tremble dance. If an older bee does a younger bee's job, they become better at learning and their brain produces the same proteins as a young bee. Bees can be trained to recognize human faces. They don't go out when it's raining and they'll also stay home if it's below 10 degrees Celsius. They don't like the smell of bananas. They are regarded by most scientists as the smartest insect in the world, just ahead of ants and cockroaches. It can get a little crowded in here! You better be be a team player because there can be up to 60,000 bees in a single hive. Most of them are female with a ratio of 100 females for every male.